Introducing the RotoMatic, the portable powerhouse tool that fits in the palm of your hand. It has the power to drill, the strength to grind, and the versatility to buff and polish. 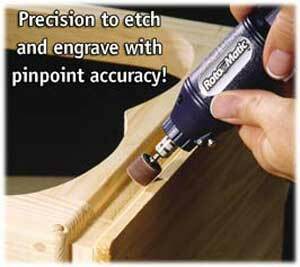 The RotoMatic even has the precision to etch and engrave with pinpoint accuracy. The secret is the 10,000RPM motor that allows you to cut, sand, and drill all in one simple step. The easy change chuck gives you the versatility to polish a silver antique or grind down a rusty nail. The RotoMatic is strong enough to remove rust, yet accurate enough to sharpen the dullest blade. It takes the guesswork out of craftwork and makes any weekend project a little bit easier. Sanding a rough edge down to a smooth finish is now a breeze. You can also put the lustrous shine back in your metals. Personalize your most prized possessions in one easy step. Don’t replace or retile; use the router to make old grout look like now.